This DVD features the renaissance of steam in the South, with two living legends�engines 4501 and 610�returning to carry their flags before the public. Gleaming in green and gold #4501, the little Mike that started it all, charges through the New River Gorge and across the mountains. The Southern's Jim Bistline narrates the film, recounting the early struggles as the steam program grew. Then the monster 2-10-4 #610 breaks in with heavy freight on the old Fort Worth & Denver �Roller Coaster� main from Fort Worth to Wichita Falls; next, on the Freedom Train; and finally, double-heading across the Blue Ridge together with #4501. 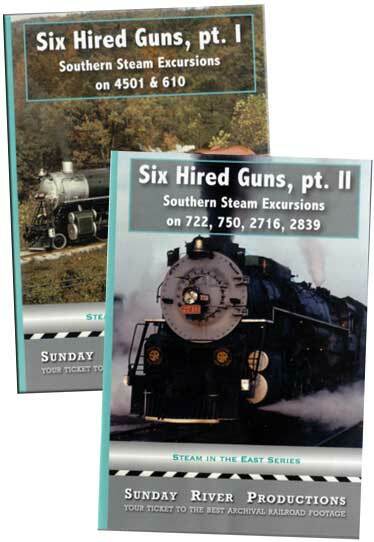 The story of the renaissance of Southern steam continues with double-headed trips behind Southern Railway #722 and #750 through the gorge of the beautiful French Broad River. The ex-Canadian Pacific Royal Hudson #2839 appears on a four day swing over the highest summits of the Appalachians via the old Clinchfield Railroad. Finally, C&O 2-8-4 #2716 tackles the famous Braswell Grade in Georgia. Dramatic air photography captures the sweep of the finest scenery in the South, while close-ups from the ground capture the grit and power of mainline steam brought to life. As the Norfolk Southern relights the firebox of Southern steam today, this show tips a hat to those who kept the flame burning for twenty-five years. whitelightin (Murfreesboro, TN) on 2012-03-01 17:48:06. A great video for us Southern Steam Program fans! Has some footage of the 1977 NRHS Convention which was held in Roanoke, Va.